EduTALK Webinar: Autonomy and Robotics – A Gentle Introduction. 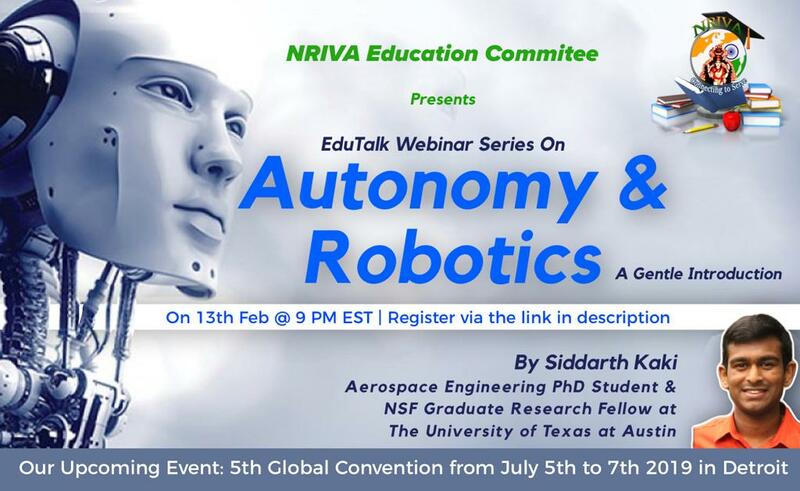 Welcome to EduTALK – Webinar series on various key topics for our NRIVA NextGen Kids presented by accomplished NRIVA Youth. Please register to this webinar by clicking the Register button below. What: Autonomy & Robotics – A Gentle Introduction. This webinar would cover questions like – What exactly are robots, and how do they actually work?. You can also learn about the vast, multi-disciplinary fields of autonomy and robotics, with a focus on “drones”. We can’t image how the future of tech, transportation, logistics etc would be but we might be able to understand how the field of robotics that’s an intersection of computer science and engineering could influence it. Who: Siddarth Kaki is an Aerospace Engineering Ph.D. student and a National Science Foundation (NSF) Graduate Research Fellow at The University of Texas at Austin (UT). His research interests are in spacecraft autonomy, multi-agent systems, and machine perception. His previous research engaged quadcopters for outdoor 3D mapping. He has also worked on the Mars 2020 rover mission and the Europa Lander mission concept at NASA’s Jet Propulsion Laboratory (JPL).